In Canada, regulation limits the amount of payload a hydro excavation truck can haul on public roads. 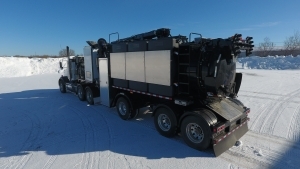 To follow those guidelines, while maximizing payload potential, Supervac offers the Atlas hydro excavation trailer. At 31 1/2 feet, the trailer is offers the compact versatility of a regular vacuum truck, with a high payload capacity of 49,400 pounds. Exclusive design and equipment combined with accurate weight distribution result in a piece of equipment with no match in the industry. It comes equipped with a flashing arrow and LED working light, full-opening rear door, protection arm and LED light, a hydraulic door lock, 3,600-gallon carbon steel debris tank and baffle, and a catwalk access ladder and handrail. Its six side-mounted and evenly distributed plastic water tanks (three on each side) have a total capacity of 1,500 gallons. The unit’s top-loading boom offers 320-degree rotation, extension of 25 feet, an 8-inch flex hose, top access door, and protection elbow. The debris tank has a 20-inch manhole for access and cleaning, a primary shutoff valve, 14-inch stainless steel floatball, a 6-inch vacuum relief valve, carbon steel cyclone and dropbox. A fully insulated enclosure houses a Webasto diesel heater for work in cold climates. The unit’s Pratissoli water pump offers 20 gpm capacity at 3,000 psi. The unit comes equipped with hose reel with a capacity of 100 feet of ½ inch hose, with a gun/lance system and 12-volt recirculation pump. Its Dynablast boiler offers 680,000 Btu, while its heavy-duty Robuschi blower offers 3,800 cfm at 27 inches Hg with hydrostatic drive. Sheehy says that the company is already receiving positive reviews from a unit currently being used in the field. He’s excited to introduce the Atlas to a wider audience. 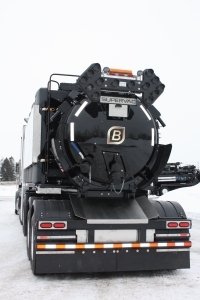 Speaking of innovation, Supervac also developed an alternative to the Atlas : the Boreas hydro excavation trailer which is specifically design to excels in cold climate like the one we have in Canada and Northern United States. 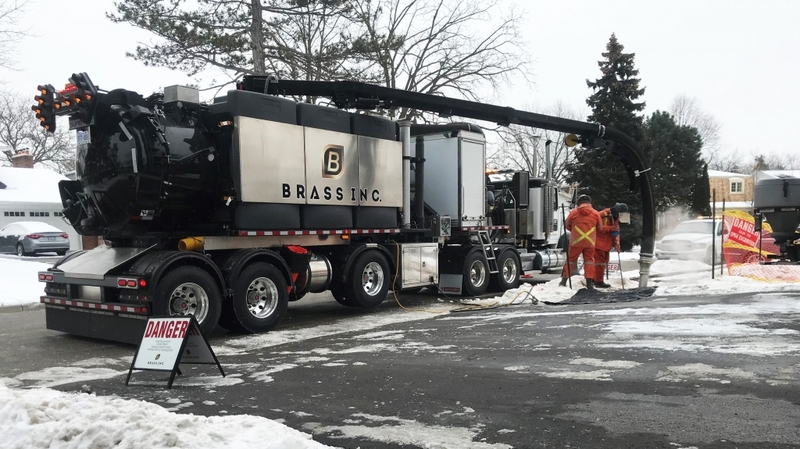 Find out all the advantages of the Atlas hydro excavation trailer !